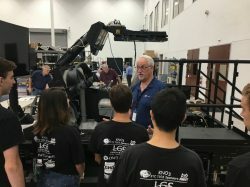 TAMPA, August 27, 2018: One of the many ways ASI gives back to the community is through local school outreach programs and the various Science, Technology, Engineering, and Math (STEM) initiatives across multiple states within which we work. 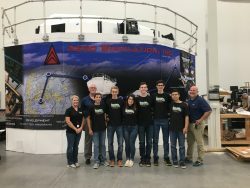 This month in Tampa we hosted the, literally, World Famous KNO 3 Robotics Team from Plant High School. KNO3 was established in the fall of 2013 with the goal of introducing STEM opportunities and provide a sustainable platform for students to learn lifelong skills of self-confidence, communications, and leadership. By engaging students in a competitive, yet fun and exciting program, KNO3 encourages students to pursue education and career opportunities in science, technology, engineering, and math. 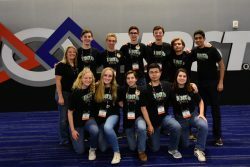 During their visit, KNO3 demonstrated their robotic expertise in design, software programming, CAD, and multiple disciplines of engineering by demonstrating two of their robots’ which they had recently entered in local, regional, state, national, and international competitions. One of which placed second in the World Competition last year. 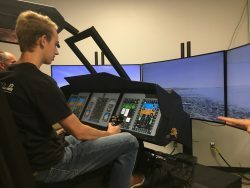 Students then got a tour of ASI’s headquarters and high bay and even had a chance to fly one of our H-60 Reconfigurable Flight Training Devices which are ideal for training from beginner to experienced aviators in nearly all levels of tasking and training. If you and your school or civic organization would like to learn more about ASI engineering, and the exciting careers in modeling, simulation, and training associated with engineering, reach out to us for more information.